The General Form Settings may be used to customize the action after submission, permissions, styling, and messages for an individual form. Configure your form's General Settings by going into your form's → 'Settings'. Choose what the user sees after an entry is submitted. Select one of the following: 'Show Message', 'Redirect to URL', or 'Show Page Content'. 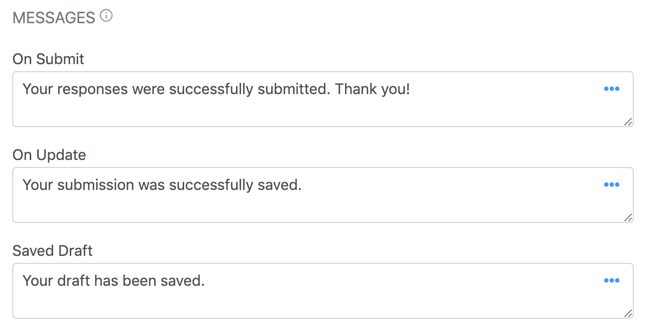 After an entry is submitted, a success message will appear. This message can be modified in the 'Messages' section of your form's Settings. You can add any values from the submitted entry to your confirmation message, including conditional statements. You can also choose to include the blank form below your confirmation message. This is helpful if users will be submitting the form multiple times in a row. If you would like to change the default 'On Submit' message, go into your Formidable 'Global Settings' and scroll down to 'Default Messages' → 'Success Message' box. Send users to another page or site after form submission. In the 'Redirect to URL' text field, insert the URL of the page where you would like to send the users. Conditional statements can be used here as well, which will allow for conditional redirection based on a field selection in the form. To redirect to a different website, you can add this conditional statement directly in the 'Redirect to URL' text field. Replace 25 with the ID of a field in your form and replace 'Option 1', 'Option 2', and 'Option 3' with the different options in this field. If you are using separate values in this field, then you need to change [if 25 equals="Option 1"] to [if 25 show=value equals="Option 1"]. If you want to redirect to a different page on the same site, you can add this conditional statement instead. Replace 25 with the ID of a field in your form and replace 'Option 1', 'Option 2', and 'Option 3' with the different options in this field. Also replace 'option-1', 'option-2', and 'option-3' with the pages where you want your users to be redirected. If the user selects 'Option 1', then they will be redirected to the 'example.com/option-1' page in your site, if they select 'Option 2', they will be redirected to 'example.com/option-2', and if they select 'Option 3', then they will be redirected to 'example.com/option-3'. Need more advanced control of the form conditional redirect? See the code examples for the frm_redirect_url hook. Present a message from another page when an entry is submitted. If you have a page you would like to protect by requiring a form to be submitted before viewing, this is a good option. You can mark the page as Private, making it inaccessible to users, but the content from that page can still be used in the success message. To create a form confirmation page that contains the submitted values of the form, follow the steps below. Select "Display a Message" in your form settings. Piece together the message you would like to show on the confirmation page. You can add submitted entries to your confirmation message by using the links and buttons in the right side bar. You can also add HTML and inline CSS to this message box to style your message. Copy this message and paste it into the HTML text box of a WordPress page. This will be your confirmation page. "Display Content from Another Page". In the dropdown, select the page just created. You can choose if you would like to save entries from this form or not. All the entries will be saved automatically unless the Do not store entries submitted from this form is checked. Note: There is no way of retrieving entries that are not saved. This is recommended for long forms. Instead of a complete page refresh when you load or update a form, the form will be loaded and saved with Ajax. This will make the load time considerably faster for long forms. Allows the user to submit the form without a page refresh. Ajax refreshes only the form when the user hits Submit by exchanging data with the server and updating parts of a web page without reloading the whole page. Note: If your form contains a file upload, rich text, or signature field, it will not be submitted via AJAX. This is a current limitation of the AJAX Submit feature. Required fields, phone format, email format, and number format can be checked instantly in your browser. After typing into a field the format will be checked, and any error messages for the field will be immediately added or removed without clicking the submit button. Allows you to choose which user roles can see and submit the form. When you select a lower user role, such as Subscriber, then all higher user roles have access to the form as well. Note: Even if you don't publish your form, it may be accessible via the preview URL. If you do not want unauthorized users submitting your form, we recommend that you set the form visibility to prevent this. You may choose to limit number of form entries to one per logged-in user, IP address, or saved cookie. This will allow certain users to edit form submissions. You may allow a particular user role to edit their own submissions or all form submissions. When you select a lower user role, such as Subscriber, then all higher roles will have the same editing permissions. To learn more about editing responses, click here. On Update: If you allow front-end editing of entries, you may choose what the user sees after the form is updated. Allows the user to save a partially completed form as a draft. When the user returns to the form, he/she can continue where they left off. 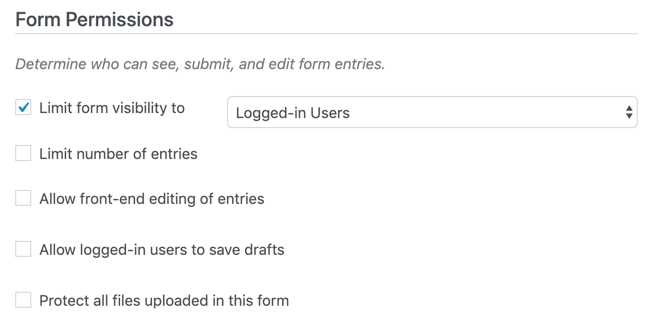 Users can save their draft as many times as they would like, but once it is submitted, it cannot be reverted to a draft. Each user can only have one draft at a time. Additionally, when this option is enabled for multipage forms, a draft will be saved automatically each time a user goes from one page to another, regardless of if they are moving from Page 1 to Page 2, or Page 1 to Page 4. To change the 'Save draft' label, go to the Customize HTML tab for this form, and scroll down to the 'Submit Button' box. Find '[draft_label]' and replace it with your label of choice. When a file upload field is in the form, this option will appear. When this option is checked nobody can access the file through the file’s URL. Also, the file can not be found by google (or other search engines). * Please note that file protection is limited to Apache servers. File protection on Nginx servers is not yet supported. Set your form to open at a later date or close automatically to stop accepting entries. While open, the form will appear wherever the form shortcode is used. When closed, the 'Form Closed Message' will appear in place of the form. To set a specific time, use HH:MM format. For example, to open the form at 8:30 AM, use 08:30 for the time. To open at 1:30 PM, use 13:30. This time will use the timezone set in your WordPress settings. Open - By default, the form is always open and will accept submissions indefinitely. Closed - Set 'Closed' as the form status to manually close the form at any time. Schedule - Schedule the form to open and/or close on specific dates. Limit Entries - Close the form after a specified number of entries have been collected in the form. This is based on the total count of entries in the form. Schedule and Limit Entries - Schedule the form by date and limit by the number of entries in the form. When both a close date and limit are set, the form will be closed based on which is reached first. Formidable Forms Pro includes the option to include a progress bar or rootline in multipage forms. This setting is visible when the form includes at least one page break field. By default, a multipage form will hide both the progress bar and rootline from appearing. However, you have three options to choose from. When you show either a Progress bar or a Rootline in your form, you have the option of showing page titles for each page. If you would like to enable this feature, simply check the box labeled 'Show page titles with steps' and then enter a page title for each page in your form. Please note: If you leave any of these fields blank, your progress bar or rootline will have no title for the respective page. By default, the Progress bar or Rootline will show page numbers. To disable this feature, simply check the box labeled 'Hide the page numbers' and then update your form. By default, the Progress bar will show a vertical line separating each page in the progress bar. Similarly, the Rootline will show a horizontal line connecting each page in the form. If you would like to hide these lines, simply check the box labeled 'Hide lines in the rootline or progress bar' and then update your form. Select which styling to use for your form. All Styles that have been created in Formidable → Styles will show up in the Style Template options. 'Always use default' will be selected as the default option. This will use the Style template that has been marked as the default template. If you choose not to use Formidable styling, your form will adopt your theme styling. Set the text for your Submit button. Set the text for your Update button. This box will only appear if you check 'Allow front-end editing of entries'. Choose to have the Submit button centered, inline, or default. By default, it will sit below all the fields in your form. The submit button includes options to either conditionally hide or disable it. These settings apply to the submit button on the last page of the form, and not a next button added by a page break field. Click 'Use conditional logic', and add settings to hide or disable the submit button. This works just like the field conditional logic. The logic includes the option to hide the submit button until a checkbox is checked. Customize your messages that will be seen after the form has been submitted or saved as a draft. You can add any values from the submitted entry to your confirmation message. Use the links and buttons in the right side bar to add fields from your form. What will be seen when you submit a completed form. The message that will appear after a form is updated. This box will only appear if the 'Allow front-end editing of entries' box is checked. The message that will be shown after a form is saved. This box will only appear when the 'Allow logged-in users to save drafts' box is checked.